How can companies compete successfully in a sea of products and a flood of information? One possible approach that we recommend to our customers is value based branding. Brands attract people by values. Because values bind us together. They are the foundation for the appeal and gravity of a brand. People don’t buy what you do, people buy why you do it. As it turns out, all inspiring companies and organizations use the same pattern. All the great inspiring organizations in the world think, act and communicate in exactly same way. They communicate from the inside out. From the “why” to the “how” to the “what”. And it’s the complete opposite to everyone else. The “what” reflects the products and services a company offers. All companies know what they do. 100%. Considerably less organizations know how they do it. This is called the differentiating factor, the value proposition or USP. But the decisive factor is the question of “why”. It’s about the purpose, the cause, the believe of a company. And people don’t buy what you do, people buy why you do it. The Golden Circle interestingly correlates with the structure of the human brain. When a company communicates from the inside out, they are talking directly to the part of the brain that controls behaviour: the limbic system. This part of the brain is responsible for emotions such as trust and loyalty. Simultaneously it handles all decision making and controls behaviour. This contrasts with the neocortex. This part of the brain is responsible for rational, analytical thinking and language. 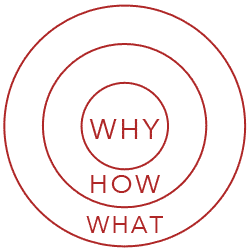 So to influence purchasing decisions, the “why” is key. It appeals to the heart of clients before their brain. The communication of the vision and values of a company attracts people who believe what they believe. It attracts people that share the same values. Ultimately it creates trust and loyalty. But why is trust and loyalty is so important? The reason is the law of diffusion of innovations. For mass acceptance, for a product or idea, the groups “innovators” and “early adopters” need to be convinced. They make up about 15% of the population. The vast majority is directed in their decision by this group, the group that aligns itself strongly in their behaviour according to their own values. People buy from inspiring companies not because they have to, but because they want to. Customers become loyal fans who are willing to pay a premium. Such companies are more successful in the long term and generate higher profits. And they all have one thing in common. They think, act and communicate from the inside out, starting with “why?” Their journey begins with their values. Simon Sinek’s presentation is available on the TED website and ranks there as the 7th most viewed video. Next Next post: We no longer have any privacy, or do we?